Step back in time as you become a character in the never-ending story of Hemslock Buffington…better known as: The Phantom Artist. Stardom came easy for Hemslock, and he lived a live of fame and fortune as a Hollywood actor. He even took up painting so he could draw stunning portraits of himself! But as he aged, his self-indulgent art became a chilling reminder of his fading looks. Then one day, he banished himself from sight forever! Now, he has reemerged in a different kind of moving picture. Watch, as he draws a portrait of YOU from the great beyond! Lines take shape through time and space and land on a screen right in front of you. Walk down the red carpet and take a seat in the Phantom booth. As you bask in the glow of vintage Hollywood camera lights, watch an illustration of you form seemingly out of nowhere! Seated in the director’s chair that Hemslock now merely dreams of occupying, you will be stunned by the mysterious portrait drawn by the once great Hemslock Buffington: The Phantom Artist. If Hemslock isn’t the Phantom Artist of your dark dreams, fear not! Vita Perfetta can summon a vast range of artists from the great beyond to fit your theme: anything from superheroes to magicians, and more! 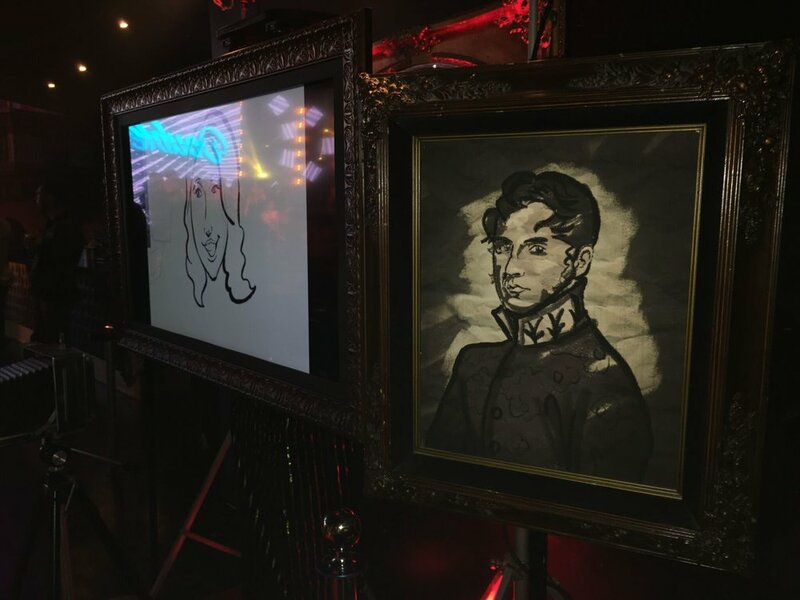 Really wow your guests with the mystery, fun, and magic of The Phantom Artist!